Electrons, Neutrons and Protons in Engineering focuses on the engineering significance of electrons, neutrons, and protons. The emphasis is on engineering materials and processes whose characteristics may be explained by considering the behavior of small particles when grouped into systems such as nuclei, atoms, gases, and crystals. 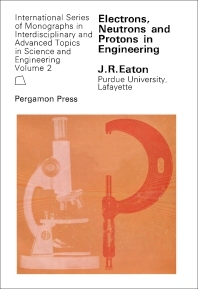 This volume is comprised of 25 chapters and begins with an overview of the relation between science and engineering, followed by a discussion on the microscopic and macroscopic domains of matter. The next chapter presents the basic relations involving mechanics, electricity and magnetism, light, heat, and related subjects which are most significant in the study of modern physical science. Subsequent chapters explore the nucleus and structure of an atom; the concept of binding forces and binding energy; the configuration of the system of the electrons surrounding the atomic nucleus; physical and chemical properties of atoms; and the structure of gases and solids. The energy levels of groups of particles are also considered, along with the Schrödinger equation and electrical conduction through gases and solids. The remaining chapters are devoted to nuclear fission, nuclear reactors, and radiation. This book will appeal to physicists, engineers, and mathematicians as well as students and researchers in those fields.